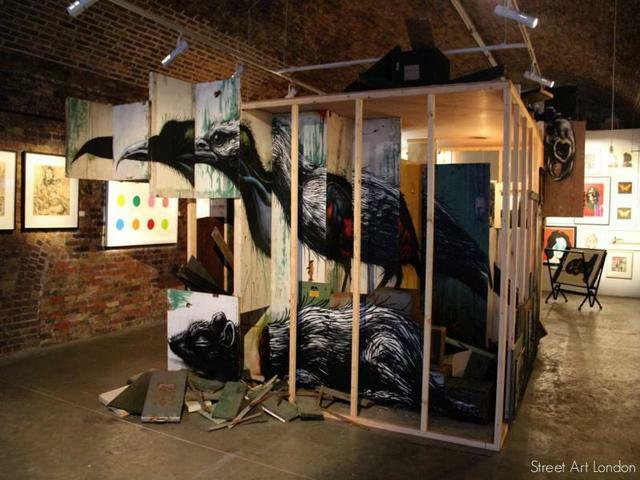 The following guest post comes from our friends at Street Art London. 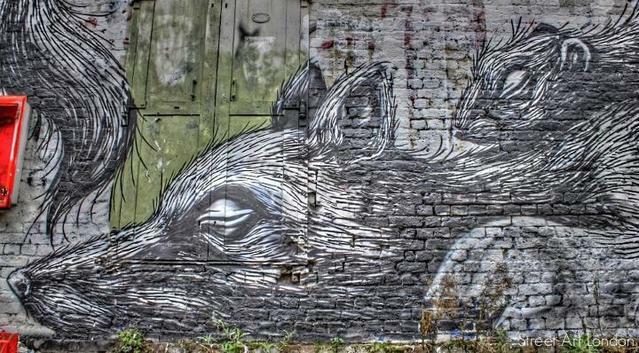 Roa, the Belgian artist currently taking the street art scene by storm, is back in town. This time he's painting a huge wall in Old Street. 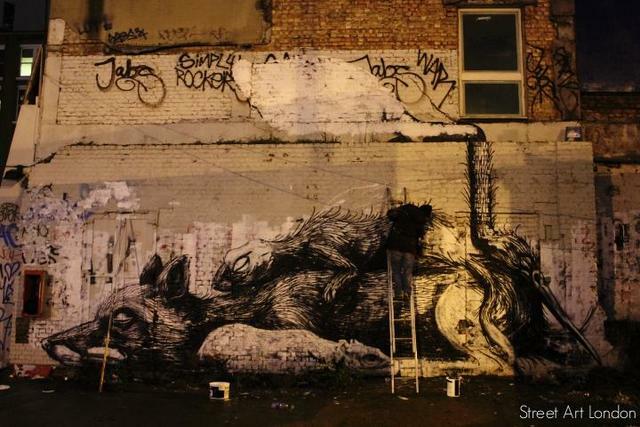 In case you haven't heard of him, Roa is renowned for his visceral black and white animals that can be found slumbering in cities all over the world, in varying degrees of decay. London has been visited by Roa on a number of occasions and he has left us some fantastic work around Shoreditch, Hackney, Brick Lane and along Regents Canal. 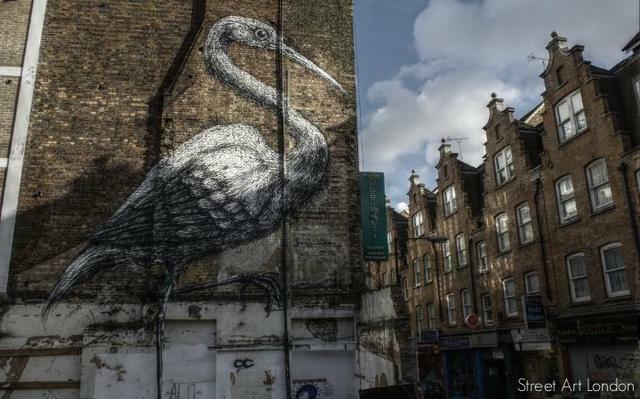 Not least, the beloved Crane on Hanbury Street and the Hackney Rabbit which was subject of a high-profile and ultimately successful campaign to save it from the unwarranted attentions of Hackney Council. We know that Londonist are big fans of Roa and that they spent last September stalking his animals around East London — check out the map here. We, at Street Art London, had the privilege of catching up with Roa over the last few days to witness the evolution of his latest wall. The new piece is one of Roa's distinctive 'animal piles' and thus far features a fox, a rabbit, a squirrel and two cranes. It is an incredible experience witnessing such inspiring creativity up close, for Roa does not sketch out his pieces first, but paints the entire wall freehand. 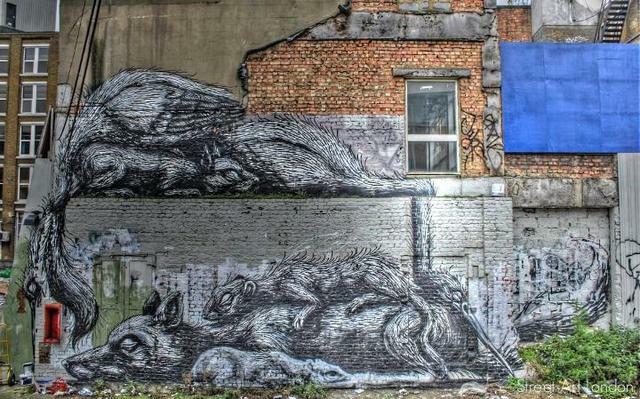 This new piece has taken Roa several days already, and he has plans to go even higher up on this wall. When finally finished, it will be one of his biggest pieces yet. Watch this space! For the latest London street art photography, news and street artist interviews check out Street Art London's site, and join our street art community over at our facebook page. 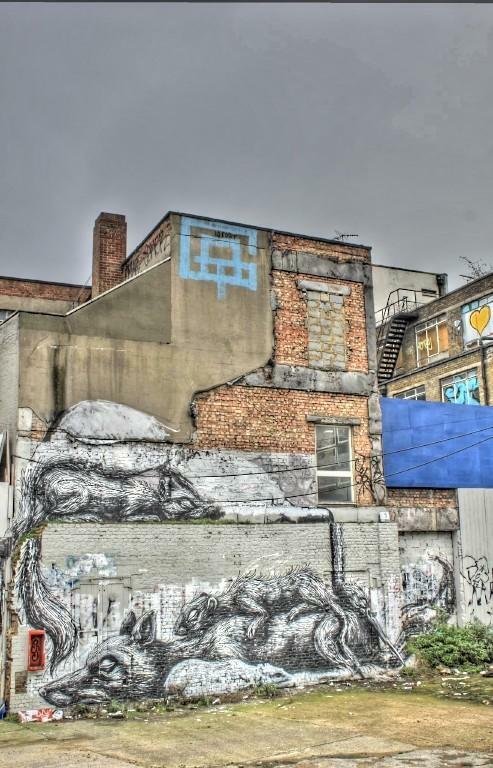 For more Roa, check out Street Art London's collection of Roa's London street pieces here at our dedicated 'Street Artists' site, which gives the low-down on all of London's best street artists. We also do street art walking tours around East London, too, and would love to share our knowledge of street art with you first hand. Roa also currently has an incredible installation (pictured below) at the Black Rat Press Gallery on Rivington Street, this is not one to miss.